The following is the first in a 3 part series... First, comparing the AFC-East offenses. This is what they call an eye-chart! The number geeks, scouring the web looking for justification of the conclusions they've already come to. Guilty! Guilty as charged! Depth charts in June are like Depth charts in February, completely different from what they were when the season began. What are fans to do, watch baseball with one eye on the ticker hoping not to see an injury in OTAs scroll across the bottom of the screen? No rocket science this time! 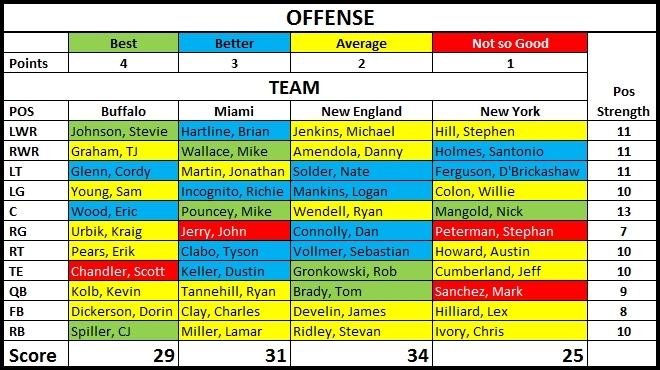 Just a simple comparison based on the current depth charts of the offenses in the AFC-East. A pro-bowl caliber player is colored green and worth 4 points. A good player, better than average at his position, is blue and worth 3 points. An average player at his position is yellow and worth 2 points. A player in need of an upgrade is red and worth 1 point. Oh, but on close inspection, the numbers don't add up! Correct, that's because the QB position has been multiplied by two. Hopefully, the need for a little stat manipulation is socially acceptable to those with a lowly QB. If not, well tough, the stat manipulator has the only copy of the spreadsheet! Therefore, the scoring system has been established by the ignorant notion that a franchise QB is worth at least twice as many points as other positions. The winner of the ACF-East may be the easiest division in sports to handicap, New England has Brady - the other teams don't, any questions? Perhaps paying so much attention to Brady and New England negates the end game, getting to the playoffs. Once in the playoffs, anything can happen. After all, the Jets went to two AFC championship games with Mark Sanchez! The obsession with winning the division turns from learning to play your own game, to figuring out how to stop those other guys, the Patriots have Brady - Miami does not. The Patriots have Brady - Miami does not! Perhaps it's a little deeper, the Patriots have an identity - Miami does not! Being overly concerned about Brady, has taken the focus away from the Dolphins going out and finding their own Brady - Identity. Drafting a QB was ignored in Miami for Tom Brady's entire career. Stopping him became more important than beating him. It means all those numbers from the master of manipulation come down to a simple fact. Ryan Tannehill needs to be better than Tom Brady, the caveat is the word, "now." Brady has lost the last two Super Bowls he's played in and while it does nothing to negate his "past" greatness, the change of the guard is imminent. Take away the stat master's QB doubling and what happens? Such magic in the hands of mere mortals! Things get a lot more interesting. It's time for the Dolphins to play Miami football and let the Patriots start trying to stop them. Great teams always make their rivals forget about being great and obsess with beating the greats. As Steely Dan once said, "if you live in this world, you're feeling the change of the guard." New England's time has come, Belichick knows it. He'll hand the keys off to Josh McDaniel as soon as Brady tells him. He's such a nice man, he even gave Josh his Tebow toy to play with. In Miami, the change of the guard is named Ryan Tannehill. If he's the real deal, Miami rises in the east. If he's another wannabee, well you know the motto, "keep drafting a QB until you get it right!" Ryan Tannehill in blue and Brady in blue? Perhaps there's a new beast in the east!